Twinbiz | Hamilton Dramaturgy's TheatreNow! Here is a new HowlRound article by TheatreNow! Season One guest Yvette Heyliger. Excerpt: “Artists are the gate keepers of truth. We are civilization’s radical voice.” so said singer, actor, social activist, lawyer and athlete, the great Paul Robeson. Robeson may not have been the first, but he was certainly one of the most outspoken citizen-artists of his day, choosing to set aside his theatrical career to become politically involved—fighting for the causes he believed in, even though it meant his own financial ruin. What makes a human being, against his own “best interests,” fight for those less fortunate, for the voiceless and the downtrodden? 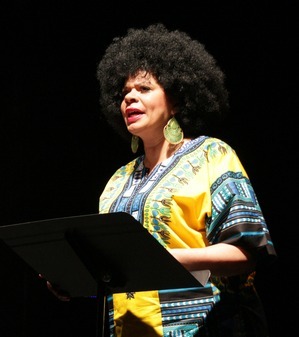 Congratulations to Season One Guest Yvette Heyliger, who continues to perform her one woman show BRIDGE TO BARAKA. Catch her in NY or LA. Yvette completed an MFA in Playwrighting from Queens College a couple of years ago, and has returned to the stage as well as continuing as an active producer. During Women’s History Month, Yvette is pleased to announce that she will be heading to the West Coast to perform Bridge to Baraka in the Los Angeles Women’s Theatre Festival. The show will be at the Renberg Theater on Friday, March 22nd @ 8pm. For tickets and information visit http://www.lawtf.org. Congratulations to Season One guest Yvette Heyliger, who will have a reading of her new play in NYC. Congratulations to Season One guest Yvonne Farrow, who is based in Los Angeles.Yvonne Farrow is the newest member of the Board of Directors at the Los Angeles Women’s Theatre Festival where she was recently elected Sergeant of Arms.LAWTF is currently gearing up for their exciting 19th Annual Festival from March 22-25, 2012 at the Electric Lodge located at 1416 Electric Lodge, Venice, CA. Yvonne is a producing artist and co-partner in the production company, Twinbiz. With twenty-five plus productions under their belts, Yvonne was awarded the first ever Emerging Producer Award at the 2011 National Black Theatre Festival with partner, Yvette Heyliger. In February 2011, Twinbiz launched its annual National Black HIV/AIDS Theatre Initiative, commemorated with a Resolution from the City of Los Angeles. Also an award-winning actress, producer, filmmaker, choralographer and Metaphysical Minster, Farrow has a wealth of experience from which to pull in service to the Los Angeles Women’s Theatre Festival and is very much looking forward to her tenure there. The Los Angeles Women’s Theatre Festival empowers women artists to engage and inspire communities through the production of multidisciplinary solo performances and educational outreach. The annual Festival honors and celebrates the achievements of extraordinary women in theatre. For more information visit www.lawtf.com. Congratulations, TheatreNow! guests Yvette Heyliger and Yvonne Farrow. As Twinbiz™ partners (twins in the business), they have been selected to receive the inaugural National Black Theatre Festival Emerging Producer Award. The festival, which showcases outstanding Black Theatre from around the country, will be held August 1 – 6, 2011 in Winston-Salem, NC. The twins will be presented with this honor at the Opening Night Gala Awards Banquet on August 1st. The National Black Theatre Festival (NBTF), founded by the late Larry Leon Hamlin, has been held biennially since 1989. The event attracts thousands of national and international patrons, theatre professionals and scholars to Winston-Salem. Approximately 35 companies are selected to perform during the week for a total of over 100 performances. For more information and to buy tickets visit http://www.nbtf.org. The NBTF Emerging Producer Award was created to celebrate the achievements of rising theatrical producers, to encourage their continued growth in the industry, and to bring about the awareness of the need to both reach back to acknowledge those independent producers who have been in the trenches presenting work “by any means necessary,” as well as to inspire and raise-up new producers of color. This award ensures the health, longevity and future of Black Theatre, work for its theatre artists, and the continued inclusion of black plays in the canon of American Theatre. The twins have been “producing coast to coast” for over twenty years. The TheatreNow! interview revealed the creative process of WWDJ?, written and directed by Yvette, and starring Yvonne.